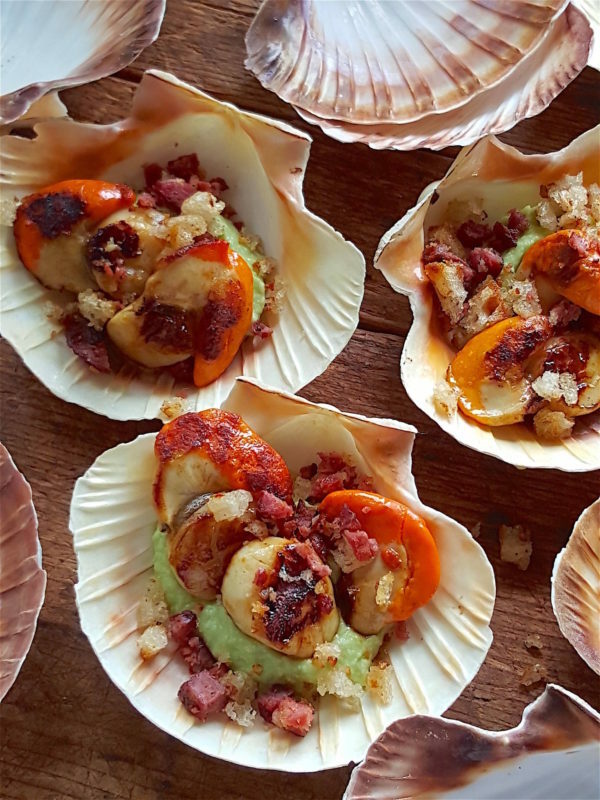 Scallops with Chorizo Crumb – what a way to celebrate spring! What a way to celebrate spring! 1 Heat extra virgin olive oil in a small frying pan (skillet) over a medium heat. When oiI is hot, add cubes of bread. Stir and cook until golden. Transfer to a plate and sprinkle with sea salt. Reheat pan and add chorizo and brown on both sides. Add garlic and toss gently until garlic is lightly browned. Tip onto a chopping board, add bread and chop everything finely. 2 Halve avocado and remove stone, then flesh. Reserve some for dicing for the top and put remainder in a bowl with lemon juice and a pinch of salt. Mash to a purée, then run it through a sieve. Dice reserved avocado and squeeze a tad of lemon juice over the top. 3 Trim any blackish bits from scallops, rinse and pat dry. Toss in a bowl with olive oil. 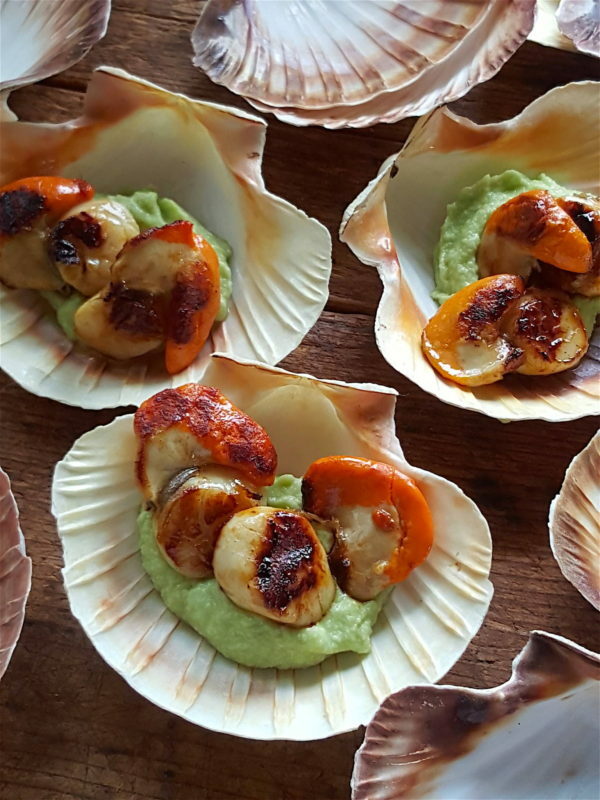 Heat a large non-stick ridged grill pan or frying pan over a medium-high heat and when it is nice and hot, just giving off a slight haze, swish the scallops in the oil in the bowl, then add them to the pan one by one (don’t dump them in, one on top of the other). Leave them where they land, don’t move them around, so they can get a rich golden brown and form a sticky coating. Cook for about a minute a side, depending on their size (the pan needs to be hot!). 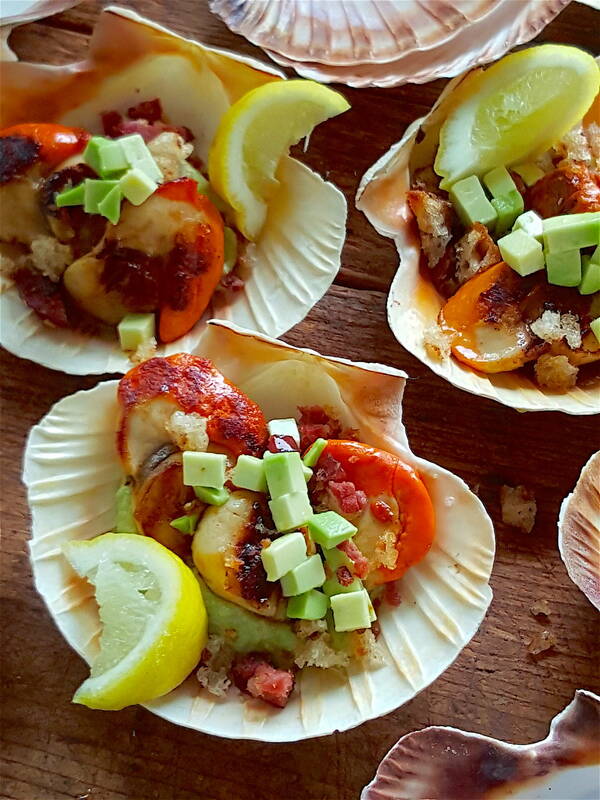 4 While scallops are cooking spoon avocado purée into serving dishes. Top with hot scallops when they are ready. Sprinkle with chorizo crumb then top with the diced avocado. Serve immediately garnished with lemon wedges. Oh, if you are serving Americans, you might like to remove the coral (the orange part; the roe). We eat it in New Zealand, as they do (mostly) in Australia and in the UK, but it’s not appropriate in other parts. Each to their own!